ABC News today writes a bit on the Charlie Foundation Gala to honor Meryl Streep. Streep was in Bloomingdale (Friday) to help raise money and awareness at the Charlie Foundation’s Inaugural Gala. That charity raises money to help find a cure for pediatric epilepsy. Streep starred in a 1997 film called First Do No Harm, which centered on a boy with severe epilepsy. 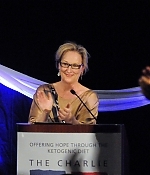 “I’m really proud to be associated with the foundation to have played some small part in getting the word out the ketogenic diet and all the protocols that are associated with it,” Streep said. The ketogenic diet that Streep refers to has been beneficial to more than half of the children who’ve tried it. For now, there are only a few pictures from yesterday’s event. My thanks to Joan for sending them in. Edit: HQ pictures from the event have been added. More than 350 guests flocked to Bloomingdale on Friday for a fundraiser staring Meryl Streep. She touted the ketogenic diet, which supporters like Streep say can treat the disease, making symptoms drastically improve or disappear. “That people aren’t being told about this, I find that really unconscionable,” Streep said. On the left are two more pictures by loyal visitor Pam, who has attended the benefit.